A coworker showed up to work a while back with really fancy fingernails. I’m not just talking about painted nails — I mean, cool printed patterns. Turns out she went to a site called Jamberry Nails, and holy wow do they have a lot of options for cool nails. But they’re also $15 per set (although since each batch of “nail shields” can do your nails 2-3 times, I guess it comes out to only five or ten bucks per application). So I did what I always do when confronted by a price I’d rather not pay — I went to eBay and searched for cheaper, flimsier imitations. Here’s what I found: Nail Polish Stick. 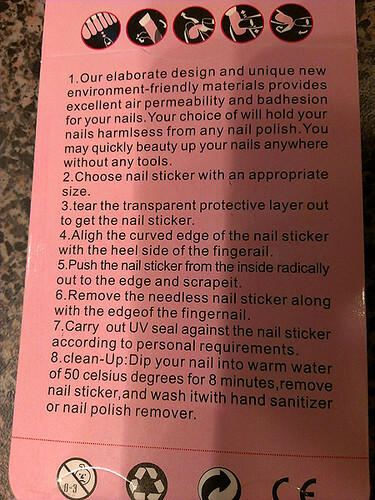 Each package only does one set of nails, but they only cost a buck fifty each. That includes shipping from China. And while the Jamberry nails are thick and sturdy and apparently easy to apply, these are floppy and difficult. BUT CHEAP! Did I mention the cheapness? They appear to come in the following sizes: 1 extra-large, 1 large, 3 medium, and 1 small. I decided to do my toes, and didn’t use the large. I’m not much of one for doing my fingernails, since I keep them unfashionably short. Plus, I figured this stuff would last longer on my toenails, since I don’t do much typing or filing with my toes. So I used the transparent top layer as an assistant, much like when you put vinyl decals on your car and they have that clear sticky sheet over the top. 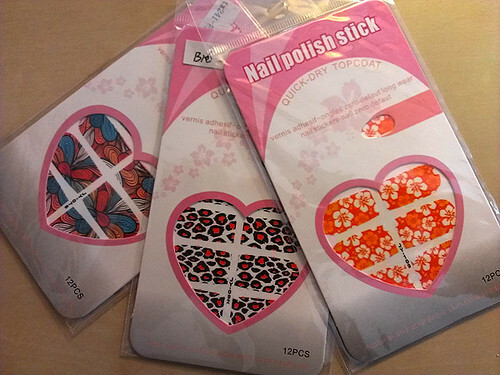 Just make sure your nails are clean and dry, stick the thing on, run a fingernail along the edge to cut away the extra, then throw a coat of clear polish over everything. I ended up not lining up this big toe quite right. But the magic of doing your toes is that they’re almost always a good 5 feet or more away from your eyes, so you could make a thousand tiny errors and not really see them. Here’s the full set. And if you even back away a little bit, you can see that they look pretty cool. There were a few bubbles and ridges in there, but that’s mainly due to my ineptitude. Still looking pretty darned good from 5 feet away. Although up close you can tell that my toenails don’t grow especially fast, and that the stickers have worn away at the ends of the big toes. And while they advise soaking in warm water for 8 minutes to remove them, I just peeled them straight off. They might have been a little more flexible after soaking, but they still came away pretty well without. I was a little worried that they’d come loose in the shower, since soaking in water is one of the removal steps, but there were no problems at all. They stayed well-stuck the whole three weeks. I even managed to gouge one of them when I ran over my toe with the caster on Scott’s office chair — a big chunk of one of the big toes was sticking up in a flap. I just smoothed it down and threw another coat of clear nail polish over the top. Like everything from China, these took about 3 weeks to arrive. But since they last for 3 weeks (at least) as well, I can always order up more when I put the last set on. 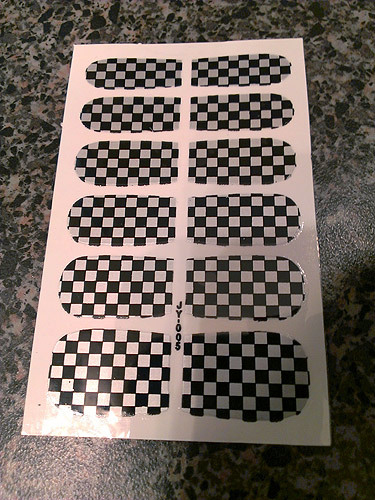 Now, since I took the silver and black checkerboard pattern off last night, I have to decide what to go with next. Orange Hawaiian? Pink leopard? Colorful swirlies? Hmmmm. I’m probably not the only one who misses you sharing.